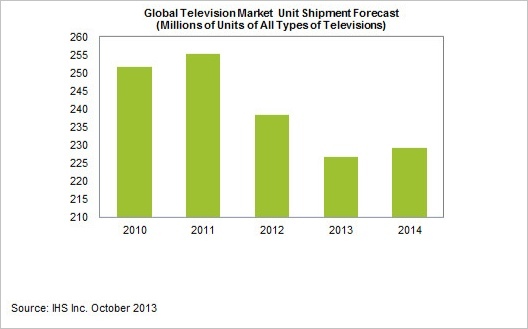 Research firm IHS has updated its forecast for 2013 global TV shipments, now predicting a decline of 5% for the full year. This would be the second consecutive down year, following a 7% falloff in 2012 (I'm confirming whether this is the first time IHS has ever seen consecutive year declines. UPDATE: IHS has confirmed this is the first-ever 2 year consecutive decline). Shipments for 2013 are now estimated at 226.7 million units. IHS believes 2014 shipments will increase by just 1% in 2014 to 229 million units. IHS analyst Jusy Hong noted that there are a number of reasons for the 2013 decline, but the main ones are global economic weakness and maturity of the TV market in advanced regions. Just last week, IHS released a survey on Smart TVs, showing relatively high awareness, but low purchase intent in the U.S. as price emerged as the top decision-making driver, eclipsing screen size. Looking at the IHS data together, it's hard not to conclude that TV manufacturers are entering a very difficult period in the U.S. particularly for Smart TVs. With many households having purchased large, high-quality flat screen TVs in the past few years that provide a superior viewing experience, the bar to upgrade has risen substantially. With the demise of 3D, Smart TV functionality has become the industry's main selling point. But, as my colleague Jose Alvear pointed out last week, consumers can increasingly obtain the "connected" functionality that Smart TVs offer very inexpensively with devices such as Chromecast, Apple TV, Roku and others. In addition, tens of millions of homes already have connected functionality through gaming consoles, Blu-ray players and other installed devices. Add to the bleak picture that many homes own tablet(s) which are becoming personalized TVs, in effect substitutes for buying a new TV for a second or third room in the house. TV manufacturers are facing a very uncertain time as consumer behavioral changes and new devices present a radically different landscape. Absent a must-have feature breakthrough in new TVs, it would not surprise me if actual shipments for the next few years continued to decline.